Will we reach a point when it is not possible to go any faster? 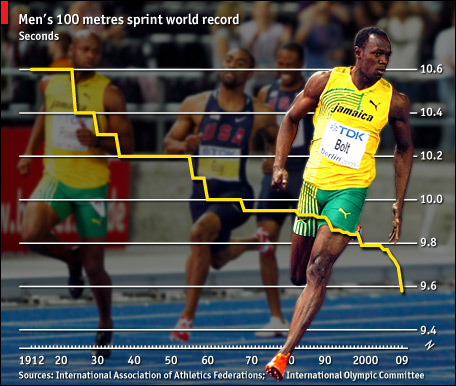 Did Usain Bolt perform better than Don Lippincott, way back in 1912 – or did he just have more help? We will continue to raise the ceiling indefinitely because we modify, augment, improve and make ourselves progressively more cybernetic organizms, through increasingly complicated science, genetic-engineering, nanotechnology, technology, psychology and artificially-induced natural-selection through the streaming of talent into the areas where it has genetic advantages (thanks Malcolm Gladwell for that last thought)… as we inch closer to the fastest conceivable time of running at the speed of light.